For years the Berliner Philharmoniker have been famous for their acclaimed concerts in Japan. In this live recording from the year 2000, they perform under the direction of Mariss Jansons. He returns to direct the Berliner Philharmoniker, rekindling their long-standing relationship that began in 1976. Tokyo s Suntory Hall is alive to a programme of particular musical energy sometimes overt and joyous, sometimes suppressed and intense. 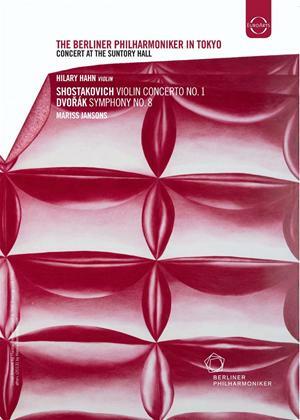 Jansons fidelity to music composed during the Soviet era remains heartfelt: Shostakovich s Violin Concerto No. 1, featuring soloist Hilary Hahn, is rendered with poise, elegance and demoniac vigour. This piece is framed by two sprightly works: Weber s charming, zesty Overture to Oberon and Dvorák s Eighth Symphony, executed with Bohemian-esque lyricism and verve. a new stunning release in our series of legendary recordings of the Berliner Philharmoniker - a new chapter of the amazing Berliner Philharmoniker Story. Hilary Hahn is a two-time Grammy Award-winning soloist. She is celebrated for her probing interpretations, technical assurance and compelling stage presence. Her extensive international performances and recording activities have made Hahn one of the most important artists of our years.